but with the portability to be easily set up and used in the field. Rocker box and mirror box are welded structures made out of box aluminum, which is light in weight yet extremely rigid. 18 and 27 point mirror cells for full support. A unique double sling is used to provide stable mirror placement without sideways shift. The upper cage rings are manufactured from a hi-tech aluminum/plastic composite that is lightweight, thermally stable and very flat. Primary mirrors are of the highest quality. Each mirror is rigorously star tested before it is shipped as a final check on its figure. Standard focuser is the JMI DX-1 two-speed Crayford. Can be upgraded to a Starlight Feathertouch focuser. 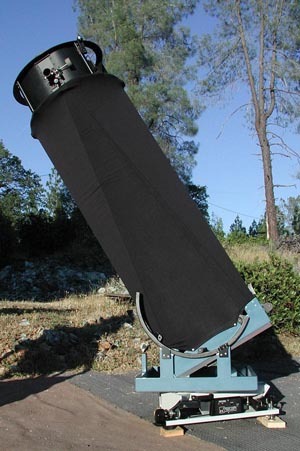 A full shroud is included with the telescope (not shown in picture at left). Sky Commander Digital Setting Circles are provided as a standard feature. The Argo Navis DSC�s will also be available. The telescope comes complete with an integrated Aluminum Equatorial Platform with the Compact drive. Can be upgraded to a Dual-axis Platform. 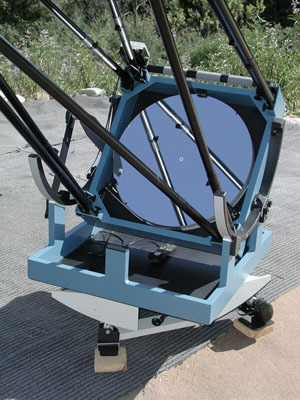 22� all-Aluminum Telescope on an integrated Aluminum Equatorial Platform. For more pictures of this prototype, click here. This is a complete telescope system. First, you can find objects quickly with the Digital Setting Circles. It�s like using a super fast �go-to� system, with your hand supplying the �go-to� power. Once your target is found, it will hang there in the center of the field for you to enjoy. Use high powers to enhance the view. Grab the scope at anytime to move around and explore an area - there are NO CLUTCHES that need to be disengaged for manual movement. With the Dual-axis Platforms, a push button box can be used to center objects or sweep a region like the lunar surface. You can even do this from your pocket with our new CORDLESS REMOTE! You are also set up for photography and CCD imaging. Imagine photographing with a large Dob! Everything is possible -- from short exposures on the Moon and planets to long exposure deep sky imaging. There is NO FIELD ROTATION to deal with, as there would be with an alt/az drive. The Platform is even autoguider compatible. See our Astrophotography page for many fine examples of the kind of imaging that can be done with these Platforms. Premium optics. The primary mirrors are rigorously star-tested before they are shipped. All mirrors come with enhanced coatings for maximum image brightness. The secondaries are hand picked and tested before installation. Custom focal lengths are available at added cost.. Rigid, durable, and lightweight welded aluminum structure on the mirror box and cell, the rocker box and the top and bottom plates of the Platform. All Aluminum parts are anodized or powder coated for maximum protection. A Compact Aluminum Platform, custom made to your specifications is included in the package. Can be upgraded to Dual-axis. Sky Commander DSCs are standard equipment. They are factory installed. The new Argo Navis DSC's are also available as an upgrade. The renowned Feathertouch focuser is standard equipment. Mirror covers, a truss tube shroud, mirror cell fans, built-in battery -- the list goes on -- all is included in the quoted price. These telescopes are complete observing systems. They are ready for high power visual viewing as well as almost any kind of astro-imaging. They would make a great observatory setup, but are equally at home in the field.